As Fall progresses, we finish up with Halloween and start thinking about Thanksgiving. Visions of roasted turkey and pumpkin pie have probably come to mind already. Now’s the time to start gathering party ideas and recipes to make your Thanksgiving feast special. 21 Creative Uses For Leftover Pumpkins – make pumpkin chips, use the pumpkin as a serving bowl, create your own pumpkin facial mask, make a pumpkin bird feeder, make a pumpkin snowman & more. How To Make Pumpkin Pie Straight From The Pumpkin – tips for making the most with what you’ve got. 10 Unique Uses For Your Leftover Halloween Pumpkins – make a pumpkin planter, pumpkin serving bowls, a pumpkin puree, a DIY facial mask, feed for wildlife, post-Halloween treats, pumpkin butter, and more. What To Do With All Those Leftover Pumpkin Seeds – here’s how to cook, roast, toast, and bake pumpkin seeds. 11 Easiest Pumpkin Recipes Using A Halloween Pumpkin – make homemade stock or broth for cooking, pumpkin risotto, pumpkin butter, pumpkin donuts, and more. 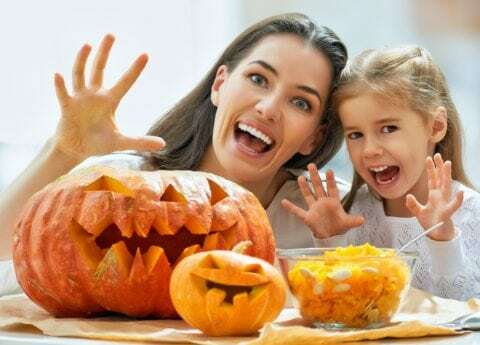 18 Post-Halloween Pumpkin Uses – flower pot or planter, make a pumpkin catapult for a pumpkin chucking party, plant the seeds and grow your own pumpkins for next year, make a pumpkin snowman, and more. 10 Uses For Leftover Halloween Pumpkins – paint them with chalkboard paint & write messages on them, cut holes in them and make a pumpkin toss game, paint them and make Christmas decorations. Thoughtful Ways To Use Your Halloween Pumpkins – use them to decorate for Thanksgiving, donate them to local zoos and animal shelters, compost them for rich soil, feed local wildlife, and more. 6 Unique Things To Do With Leftover Halloween Pumpkins – give them to your dogs to play with (pumpkin is super healthy for dogs, especially when they’re experiencing diarrhea), make a pumpkin milkshake, have a spa day at home. Some Green Ways To Use Every Part Of Your Halloween Pumpkin – donate them to local farmers, use the seeds to grow your own pumpkins for next year, and more.